The perfect balance of sweet and spicy – this finger-licking good snack will be a crowd favorite at your next tailgate or sleepover! Preheat oven to 400° F and spray a large baking sheet with nonstick cooking spray. Rinse chicken breasts and cut into 1½-inch nuggets (should make about 24 pieces). Combine breadcrumbs, salt, garlic powder, onion powder, paprika and pepper in a shallow bowl and set aside. Put those saucier skills to work! Melt a tablespoon of butter in a small saucepan along with 1 cup of hot sauce (save the remaining 2 tbsp.) Mix well and warm, but don’t bring to a boil. Pour sauce into a small, shallow bowl and set aside. In a small mixing bowl, add egg whites (or egg alternative) with the remaining 2 tbsp. of hot sauce. Take each chicken nugget and coat with the egg and hot sauce mixture. Shake off excess egg from the meat. Coat chicken in breadcrumb mix until it’s fully breaded and place on baking sheet. Repeat this process until all chicken strips are fully breaded and are on the baking sheet. Using a basting brush or spoon, drizzle about 3/4 of the hot sauce and butter mixture over all the chicken pieces. Now it’s time to heat things up! Place chicken in the preheated oven and bake until breading is crispy and chicken is cooked through – about 15-20 minutes. Remove from oven and let cool for a few minutes before handling. Microwave Mini Buttermilk Pancakes (according to the package), and start building your Buffalo Bites. 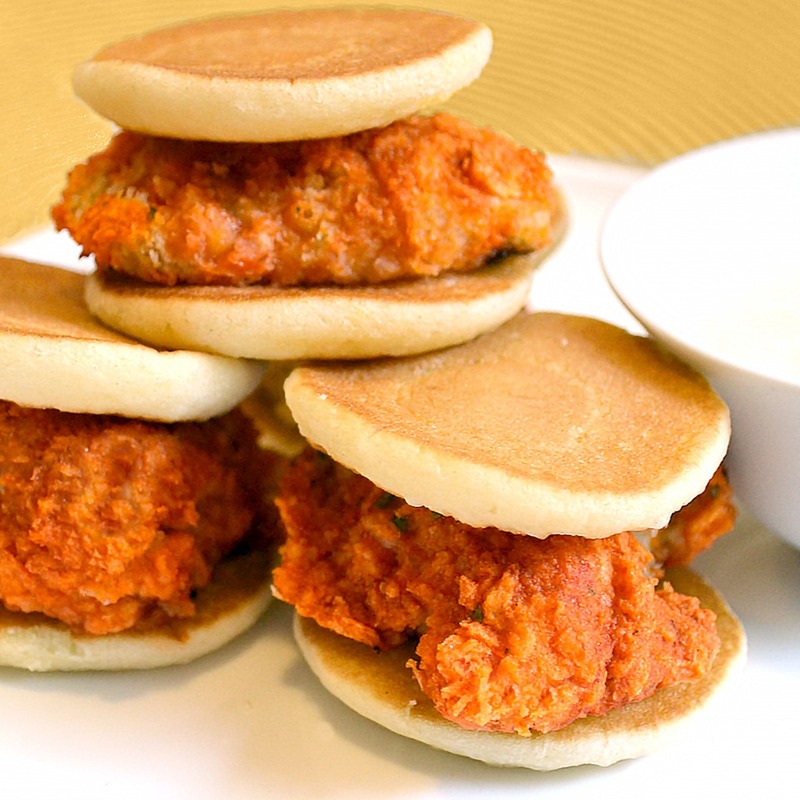 Take one Mini Pancake and place one piece of fully cooked buffalo chicken on top. Top with another Mini Pancake and finish off with a decorative toothpick to keep it secure. Serve with remaining hot sauce mixture or your choice of ranch or blue cheese dressing for dipping. Yum!